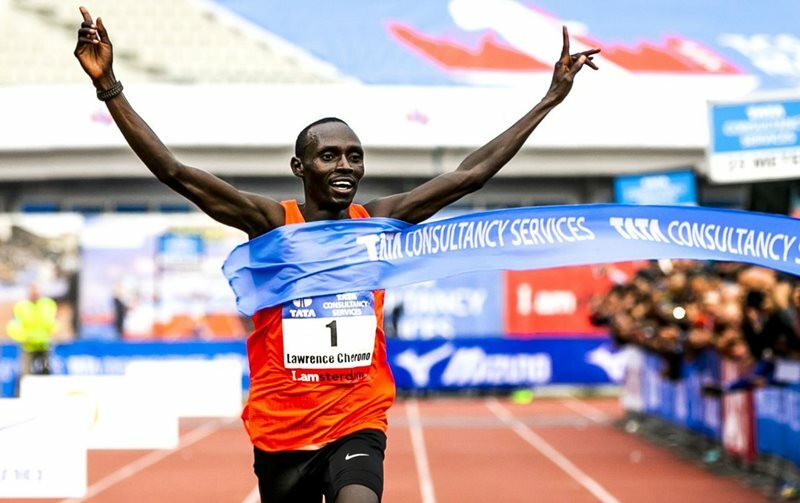 ATHLETICS NEWS - Kenya's Lawrence Cherono sprinted to victory in the Boston Marathon on Monday, overhaul Ethiopia's Lelisa Desisa in the final few metres of the gruelling race to claim a thrilling win. In damp, chilly conditions, Cherono, Desisa and Kenya's Kenneth Kipkemoi broke away from the field over the final few miles as the world's oldest major marathon reached a dramatic conclusion. Desisa, the 2013 World Champion and two-time Boston Marathon champion, looked to be on course for victory as he kicked for home in the final 200m. But with the crowds at Boston's famous Boylston Street finish line roaring them on, it was Cherono who timed his finish to perfection, overhauling the grimacing Desisa just a few metres from the tape to claim a magnificent win in 2hr 7min 57 sec. Cherono raised his arms in celebration after claiming the biggest win of his career in his first ever appearance in the Boston Marathon. There was disappointment for defending Boston champion Yuki Kawauchi of Japan, who never challenged the leading pack before crossing the finish line in 17th place. Earlier, the women's race saw Ethiopia's Worknesh Degefa claim the biggest win of her career after leading almost from start to finish. Degefa hit the front in the early stages before pulling away to finish in 2hr 23min 31sec.